The rally in the Pound, which lifted it 10% from trough to peak, appears to be fizzling. The Pound is already down 3% in the last two weeks, and is trending downward. It now stands at a four-week low against the Dollar. Looking back at the Pound’s two-month rise, it’s not hard to understand why it was unsustainable. You can see from the charts below that there was a strong correlation with the Euro and the S&P 500 over the same period of time. This suggests that the Pound rally was less a product of changing fundamentals and more due to a sudden decrease in risk aversion. By no coincidence the rally in equities, the Euro, and a handful of other proxy vehicles for risk, all came to and end at the same time as the Pound. In a nutshell, the markets are back to focusing on fundamentals. Namely, the risk of a double-dip recession, combined with a lack of resolution in the Eurozone debt crisis is causing investors to think twice about making bets that entail any kind of risk. Ironically, the efforts of the British government to curb spending and cut the deficit are perceived as making matters worse. Since these measures won’t be offset by lowered taxes, they will directly lead to lower economic growth. Given that both the Pound and UK bond prices are rising (implying an increased risk of default), I think this reinforces the point I made last week about the markets not caring at all in this economic climate about increasing national debt. The icing on the cake is inflation. A British think-tank made headlines by predicting that the UK economy will emerge from recession next year, “But once recovery is under way, he thinks, then the Bank of England’s quantitative easing scheme, which pumped £200 billion into the economy in the wake of the credit crunch, will have terrible consequences.” Specifically, the think-tank is forecasting inflation of 10% and a benchmark interest rate of 10%. For now, this remains a distant prospect, and analysts are focusing on the fact that the economy will probably re-enter recession before it can officially exit from it. As for the Pound, forecasts are not optimistic: “Bears in a Bloomberg survey of strategists outnumber bulls 29 to 12, while TD Securities in Toronto, the most-accurate forecaster in the six quarters ended June 30, has the lowest estimate, predicting sterling will depreciate 15 percent versus the dollar by year-end.” According to the most recent Commitments of Traders report, institutional investors were still net long the Pound as of August 10. Futures prices, meanwhile, have moved in lockstep with spot prices, which suggests that futures traders are still waiting for more data before they weigh in on the Pound. Personally, I’m having a tough time coming up with a prediction. I tend to agree with the characterization of “the foreign exchange markets post-crisis as a beauty parade with ugly contestants.” In other words, all of the major currencies are currently plagued by poor fundamentals. 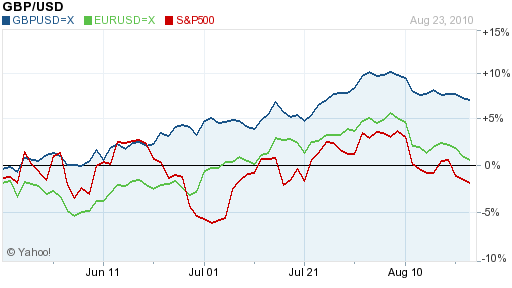 It’s hard to say that the Pound is in better or worse shape than the Dollar or the Euro. Still, given the way that markets have been trading, a return to (global) recession would not be kind to the Pound. Ironically, the efforts of the British government to curb spending and cut the deficit are perceived as making matters worse. Since these measures won’t be offset by lowered taxes, they will directly lead to lower economic growth.